Getting up early this morning and back on my rower after a 10 day break was the most traumatic thing in this post-vacation period. I slogged through my 45 minutes and it was harsh, but it could have been worse. I walked a lot and did get some exercise while I was away, but it is not the same as rowing. Going back to work after a week off was … completely undramatic. The office rumbled on in my absence, no crisis arose, nothing caught fire. It was actually quite nice. Of course, my inbox was full, my email was overflowing, and I have yet to return a single phone call, but it was still a good and productive day. This is something I am only now discovering about vacations: I have come back feeling refreshed and with a lot more energy and productivity. Despite the interruptions throughout the day, the clients and vendors calling throughout the day about various issues, all those little things that had to wait until I returned, I actually got a lot done. Tomorrow will be better because the interruptions should be lessened. How strange it is that I did not know this about being away. It seems like in previous years I come back feeling overwhelmed and disorganized for weeks after the fact, making me dread and avoid future time off. I am either getting better about organizing myself before I leave or I am getting a better attitude about work while I am away and returning. Either way, it’s good. It’s also end of the month at my part-time jobs. One is pretty simple, pretty low-key, almost on automatic pilot after so many years. A new wrinkle, though: the principal is contemplating retiring and shuttering/selling his practice at the end of the year. He has asked me to expedite the books this month for valuation and negotiation purposes. While I am happy for him contemplating retirement and moving into a new phase of life, I am a lot sad at the idea of not working with him any longer. His is a sunny, mellow, optimistic outlook, particularly considering he is an attorney and works in mediation. But working with him has been a joy for almost 16 years. The income from the gig can be made up with other side gigs, but the relationship, the friendship, the mentoring I have received from this man is priceless and irreplaceable. While I know we will keep in touch and chat from time to time, it will not be the same. It will not be our monthly status of the firm meetings over a meal or a cup of coffee. I will miss that if he does proceed with the termination of his practice. The other part-time gig is heating up once more. It’s been a quiet couple of months … money comes in, bills get paid. After being overseas for multiple weeks he’s now back in town and bursting with “projects” he needs help and assistance. I foresee lots of sorting/organizing/figuring out in my immediate future. He is a nice guy and generally pretty easy to work with, when I can find him to ask questions. Since I am someone who worries about money for a living, I tend to keep track of our spending when we are out and about. We drove a lot more this year, went farther and explored new places and attractions. We also hiked and walked a lot more as well, and I logged over 15,000 steps per day each one of those vacation days. I am delighted with that. 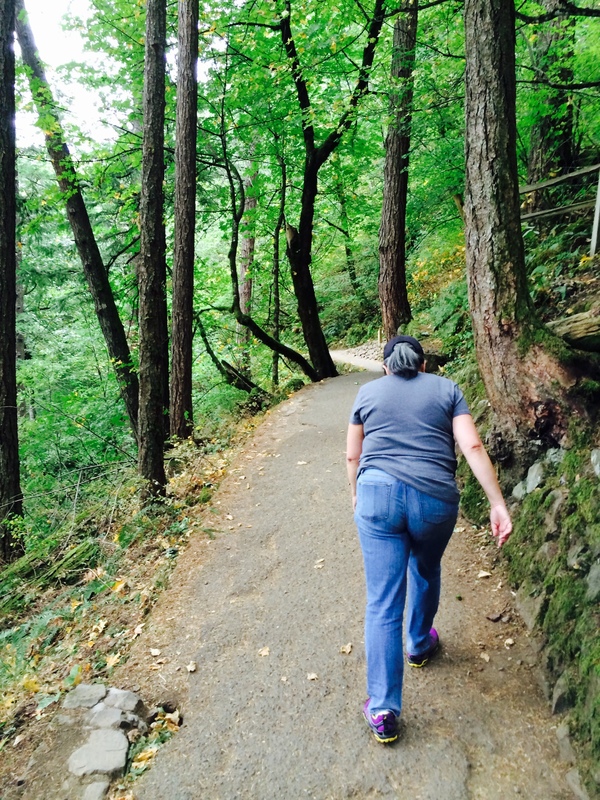 Slogging my way to the top of Multnomah Falls in the Columbia River Gorge.